Crossings are very common on the approach to junctions, and immediately after joining a new road, which makes them a hazard, especially when approaching zebra crossings after exiting a roundabout. One of the reasons is that traffic should be moving slower and therefore drivers will be more aware of hazards. But what do you do if you can’t see anyone at the crossing? In busy streets parked vehicles can hide pedestrians from view, especially children. So, if you can’t see both side of the crossings you should assume that someone will be waiting to cross and slow as you approach being prepared to stop. But what if you can see and the crossing looks clear. We watched a video from one of our vehicle cameras and found that a grown man could be hidden from view by just a black and white post. Look ate the picture below, at first glance do you see the pedestrian? No, okay on this picture we’ve highlighted the pedestrian. Moving a few frames on and now you can clearly see him. But, at first glance drivers would assume it’s clear and start to accelerate. The hazard can quickly become a danger, how might you react? A) The pedestrians walks on to the crossing and the driver slams on the brakes, watch out behind if you’re driving too close. B) The pedestrian walks on the crossing and the driver swerves to avoid him, watch out if you’re the oncoming vehicle. C) The driver holds back until he has a clearer view of the crossing area to the left and brings the car to a smooth stop to let the pedestrian cross safely. Out of the 3 choices I know which I would choose. The next time you approach an uncontrolled zebra crossing double check it’s safe before driving past, if in doubt hold back. Are you looking for a new career, do you think you would make a good driving instructor? Congratulations to Josh on passing his driving test at his first attempt. Josh had an almost perfect pass with just 2 minor faults. 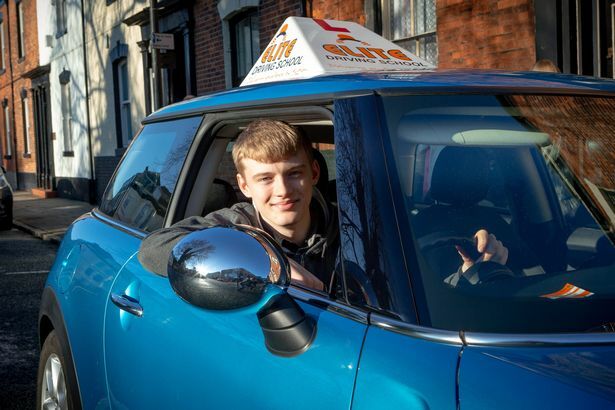 Josh’s instructor Joe Phillips said Josh did extremely well, his knowledge of Hull’s road is very limited because Josh is from Taunton in Somerset but he’s studying at Hull university . Josh might start making those long trips home by car in the future. Why should you become a driver? It’s hard to imagine just how much easier and fun life is when you can drive, and I suppose you’ll never really see the benefits until you can. If you’re used to catching the bus, getting lifts from others or you walk a lot, that’s normal for you. But if you ask a driver to use any of those modes of transport they’ll probably laugh at you. You see people grow really fond of their car. You’ll see them on a weekend with a bucket & hose pipe happily putting a shine back on the trusty steed. They’ll proudly look back as they walk away after parking up, and they’ll spot every car that’s the same as theirs. For many people owning their dream car is top of the wish list, should they win the lottery, or by chance get a huge pay rise. So, passing your driving test just to become a proud owner of your own car has got to be worth the investment. Are you ready to be a 1st time driving test pass driver like Josh? Or if you’re transferring from another instructor we can offer you the first *2 x 90 minute lessons for just £47. Congratulations to Lewis Rennison who passed his driving test on his FIRST attempt with only 23 hours of tuition! Lewis is a part of the Ron Dearing Bursary Scheme, and was so pleased to have passed his test first time! Lewis now has the freedom to drive, meaning he can drive his friends round, go shopping without having to rely on public transport, and not have to rely on mum and dad anymore! We hope Lewis has a great time driving, and we want to wish him the best of luck for the future! Students at the college are able to apply for the bursary which is worth 20 hours of free driving lessons with Elite Driving School. That’s a huge benefit when they start lessons with an Elite instructor because they already have reasonable knowledge of road markings, road signs, and the highway code. Student apply for the bursary, then they call Elite driving school to arrange their lessons, it’s that simple. There are families that struggle to pay or contribute towards driving lessons for their children, so the bursary contributes a huge chunk towards learning. Alistair, is one of the students who’s on the bursary, and knows that having a full driving licence as part of his skillset will help improve his employment prospects and make it easier for him to get to and from work. Alistair’s instructor Steve said “he’s a natural, & picking up driving at a fast pace.” He added, “Alistair has only had 6 lessons but he’s already a very considerate driver. We’re excited to help the students at Ron Dearing UTC learn to drive, with their unique offer of 20 free diving lessons. 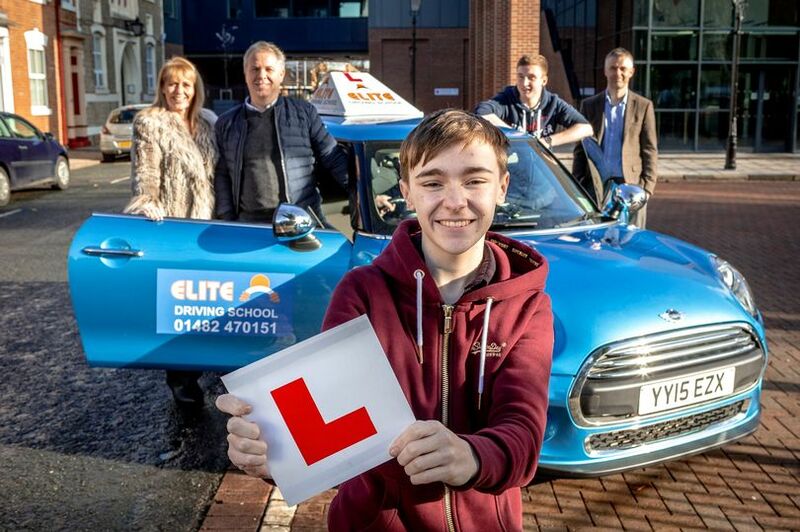 The free driving lessons will massively contribute towards these students becoming safe and responsible drivers. Many young people dream of the day they turn 17 and being able to drive. They can’t wait to get their first car, it’s so exciting, and it’s their first step to independence. How many people remember naming their first car? Mine was called Gimpy, because of it’s gimpy gold color. What name did you give your car, and do you still name your cars today? Welcome to the series of driving tips for new drivers. Each week we’ll focus on a common problem that learners experience which can stall their progress. Someone new to driving can experience a problem early doors which could put them off continuing their driving lessons. These problems tend to be minor problems with co-ordination, our using the cars controls correctly, but they can have a profound effect on a new driver. More experienced learners at some point in their driving may feel like they’ve hit a plateau and can’t push beyond it, or they feel like they’re going backwards. Either way, it’s a negative vibe and can stop these people progressing with learning, often giving up just hours away from being ready to take a test. We know how difficult it can be for learners to understand everything that they are being asked to do, and it can be difficult for instructor too, especially if they’ve tried every way they know to explain a situation. Sometimes you have to see things from a different perspective, so the driving tips for new drivers is designed to help people learn outside the car between lessons. Today’s driving tips for new drivers is: Understanding the clutch and how to use it correctly. So’ lets start by explaining the role of the clutch. Do you know what happens when you press the clutch pedal down? And, do you know why you have to press the clutch down before changing gears? Car engines need gears (transmission systems) to help vary the speed of the driving wheels. Have you ever ridden a push bike with gears? They often have 5, 10 or more cogs on the rear wheel, and well as two or three attached to the pedals. If you select the lowest gear which is 1st, it’s easy to pedal, your legs will be working quickly and you’ll reach your maximum limit, without gaining much speed. Change in to 2nd gear and it’s going to be harder to pedal but you’ll be able to go faster. So, each time you go into higher gears, it’s harder to pedal but your speed will increase. Which means if you only want to travel slowly, then a lower gear is better than a higher gear because it will be easier to pedal. Or if you are going uphill a lower gear will be easier to pedal with. Okay, if you want to change a gear you stop pedaling, this allows the gear mechanism to work freely. Now think of yourself as the engine on the bike, you supply the power to the wheels when you pedal. When you stop pedaling you stop producing power. Back to the car, when you depress the clutch you are stopping the power from the engine turning the road wheels. When you bring the clutch up you are joining the engine (power) and therefore turning the road wheels. So, when you move a car from a standstill, you have to push the clutch down to select the gear, then bring the clutch up to engage the engine to drive the car forward, or backwards if reversing. It’s the action of bringing the clutch up that causes so many new drivers to worry. Now this is where it becomes challenging for instructors to explain what’s happening, with the clutch and why learners struggle to move a car without stalling. So, stalling what does it mean? Now there’s many ways to explain the process, some you’ll understand others maybe not. But the challenge is to explain it in a way that helps you understand the movement of the pedal and the reaction you should expect to get from it. So, imagine a coiled spring that you have to apply pressure to. Think of a door that works on a spring system, which is designed to close the door after people pass through. The door requires pressure to open, but closes slowly after. Now this is the important bit. There’s a system called a servo that controls the speed the door closes by slowly releasing the pressure on the spring taking the tension out of it, otherwise it would slam shut. With the help of the server slowing the door close you could be quite some distance away from the door by the time it’s fully closed again. Back to the car, if you put pressure on the clutch pedal to push it down, you have to release that pressure slowly when bringing it back up. Like the door example, you are releasing the tension on the spring slowly, which means the car might travel some distance before the clutch is fully in the up position. As the clutch moves in the upwards direction, what catches many learners out is the fact that nothing actually happens. This is because it’s only as you start releasing the tension that the engine starts to partially engage with the driving wheels, this is called biting point. It’s at this point that the wheels start to turn, but you must still control the tension of the pedal even as the car moves, because any sudden movement will cause a reaction like a stall or jump (leap forward). If you depress the clutch and then release it quickly the car will stall (stop the engine from turning), which gives you that horrid experience of the car lunging forward. It’s like being pushed hard in the back by someone sending you tumbling forward out of control. Okay, now the second part of the clutch explanation. As you allow the clutch up through the biting point the car will start moving, but it will only creep forward so you need to give the car power by squeezing the gas pedal. You can do this while you are still bringing the clutch up, it’s like a see saw, one pedal moves up the other moves down. The amount of gas you apply should steadily increase as the car starts to move, remember your moving a heavy dead weight. I hope that explains in an easy to understand language how the clutch works. If you’ve found this driving tips for learners topic useful please leave your comment below, thanks. For a visual look of the role the clutch play between the engine and transmission see this video, it shows the moving parts which is really useful. Well, today I took my First student for a proper driving lesson, no role play, the real thing. My Student was a young man who had been near test standard 5 or more years ago but hadn’t driven since. So, my plan was to pick him up and drive him somewhere quite to get him started, after all he’d probably be very rusty & would appreciate starting from a easier location than in a busy area of Hull. I was apprehensive because it was my first time instructing after more than a 25 break, and I also had the eagle eyed Stu sat in the back to evaluate my performance and offer recommendations. As it turned out Stu proved he was also useful as my personal assistant, responsible for passing my training workbooks from the back seat when I needed them. After meeting my student and explaining the plan to drive him to location, I asked him about his previous experience on the way, and why he hadn’t taken lessons for over 5 years. He was nervous, which was evident from his shaking hands, but I reassured him that the lesson would go well, and he would enjoy his time with me. Having no previous knowledge of his ability, I asked if he had any concerns or worries from past lessons, and suggested we should start with a drive which would help him get used to the car as well as me and Stu. We both agreed that was a good idea, and before getting underway I asked him if his seat and mirrors were adjusted correctly, and if he could recall where the blind spots were. We then spoke about the balance of responsibility, and how much input he wanted and needed, and that that responsibility might alter during the lesson. I also assured him that I had dual controls, but would only use them as a last resort, and if I did use them, I’d let him know, and we’d pull up and talk about it. He asked for a dry run through the gear box with the engine off, and I also suggested he take a few attempts at finding biting point with the engine running. Ok, “ready to move” Yes, “then move away when it’s safe please was my instruction. I was prepared for him to stall (negative) but he moved the car with very little problem. “well done”, I said “that was nice & smooth” (early praise). After 8 minutes of driving a fairly basic route we pulled over to the left. This was my chance to workout the lesson plan. His driving was as expected rusty, but it was his driving position that was my first focus and in need of immediate attention. He drove way too far to the right, and a mile away from park cars, which left oncoming vehicles needing to move to the left. He also had a habit of cutting left turns resulting in the rear wheel nearly mounting the kerb on several occasions. Time for Mr fix it, ta dah. Right, I said; “How do you feel that went. “I was a bit scared he said but it wasn’t as bad as I expected”. “Yeah, I completely understand why you would be scared after 5 years, but you did well, your move away was good, as was your gear changing” I said. “What do you think about your driving position” I said, “especially during normal driving, and passing parked vehicles”? “Yes, I understand why you would be scared of hitting parked cars, do you feel you move further to the right to compensate” I said. “I’m not sure how far I am from the left” he said. So, we agreed the distance required from the left hand side of the carriageway, and an adequate distance from parked cars. We also made sure we both agreed on a measure, for example I asked him what a meter looked like to him, He demonstrated using his hands with a gap of only half a meter, so that was a big learn for him. We spoke about the result of being too far right or left and the danger of colliding with other road users, parked cars and even the kerb. We also spoke about cutting the left corners, and I explained why this happens, and the dangers of getting it wrong . “So, if we were to go back over that route again, how would you handle it differently?” I said. He explained what he would do differently, and we agreed on his aims and objectives for the lesson. After the lesson I reflected on my performance with Stu. We agreed it went pretty well, my student gained in confidence and ability, and I felt I’d done an okay lesson. Sure, I was in control of the lesson, but I felt my communication skills needed work, and I also knew I needed to involve my student more, giving him an input in the lessons direction and content, and allowing him a more active role in the decision making process. This was also confirmed by Stu after the lesson. So, the big take from today’s lesson is communication, it’s a two way thing. I should treat the lesson more as a conversation in which my student and I talk about their goals, and how between us we can acheive them. Training to become a driving instructor? Follow my Progress. 30 Years ago I qualified as a driving instructor, and spent 5 years teaching people the skill of driving. I loved helping people pass their driving test, it was a absolute buzz. Training to become a driving instructor was the best thing I could have done at the time, because it got me away from working for others, and gave me the opportunity, and independence to make my own way through life. Although I loved being a driving instructor, I found something I loved even more, which was business. And for the last 25 years I owned, managed and been a partner in four businesses, and I continue to be a director of two today. During those 25 years I’ve not been involved in teaching people to drive, but recently I volunteered to retrain. I was asked by a good friend, and respected trainer to retrain as a driving instructor, purely to help them re-model their training plan, so I said yes why not. But, what I didn’t know at the time is he wanted me to start from scratch, and that meant study preparation for the ADI part one theory. Now, I thought I still had a good knowledge of the information an ADI needed to know, but after 25 years away from the job, it’s amazing just how much one forgets. Anyway, I decided to go all in and planned to give myself four weeks of study before taking the test. Now, four weeks is a demanding schedule, because when I trained 30 years ago, I spent 20 weeks preparing for the part one before passing the paper test in Leeds. Armed, with all the usual books that you have to read, I wasted the first two weeks, and didn’t open any. So, with the fear, not to mention embarrassment of failing the test, I knuckled down and spent a fairly intensive two weeks reading and practicing the online theory software the school had provided. I managed to squeeze two hours into 6 evenings, and a 5 hour stint on a rainy Sunday. Yes, I know that’s not really intensive, but it was all the spare time I could allocate to study. I went to bed dreaming about signs, markings, stopping distances, road procedure, and goodness knows what else. Anyway the big day arrived and I wasn’t filled with confidence, but that said, even if I had given myself 20 weeks, I would have wasted most of that time doing everything other than study, and I would have still felt the same as I did. A couple of hours later, I left the test center with a reasonably healthy pass. So, the big take from this lesson is don’t wait to get perfect, and definitely avoid given yourself 20 weeks to study, because like most people, you only need 4 weeks of fairly intensive study. A big thing I learnt, was to stop wasting time sat in front of the telly. I would say many of us can find 3 hours a night to read just by not turning the telly on. On to part two. Stu took me out on a two hour assessment, and gave me some pointers of what I needed to practice in my own car, before my second two hour session. Another 2 hours later and I was taking the test. Strange turning up at the test center, and waiting for an examiner and praying that you pass. Anyway, I passed but I did get one minor for hesitancy. Me, hesitant never. It’s weird why you do stuff that you wouldn’t do normally. So, back to the present, and I’m starting preparation for the part three. I went out for my first session yesterday with Stu. It was good fun, and brought back many good experiences, but, I knew straight away that it wasn’t going to come flooding back to me, and the worlds moved on, the new buzz word is client centered learning. Basically, my understanding is that instead of telling the client what to do umpteen times and hope it sticks, we now have to find a method that helps them learn from their own experiences. This involves asking thought provoking questions, and discussing the learners needs. Now I know from experience that many people who embark on training to become a driving instructor can find the part three overwhelming. But, on a positive I think of it this way. If you had a big enough piece of land, a car you didn’t need ha ha, and someone who’s never driven before. You could throw the keys at them and say get on with it. Now without help, over time most would learn to drive the car. Now put an experienced driver next to them, and they’ll learn much quicker. Then put a driving instructor with them and they’ll learn even quicker. So, a driving instructors job is to teach a system developed by the DVSA, and manage the risk of the learning environment. So, most drivers already posses some of the skills necessary to help people learn. But, the major skill is to learn the DVSA teaching syllabus, and the skills of good communication, listening,observing patience and understanding. So, like with any new job, you have to learn a system or process, but most importantly you must want to become an expert of what you do, which means setting time aside to research and learn. And, that is what I’ll be doing this week in preparation for my next lesson with Stu. I’ll keep you informed of my progress, mistakes I make (which will be many) and my big learns as I go through the final part of the training. …you haven’t passed your test today. How many people have heard those words when they took their driving test for the first time? A BBC driving expert (?!) has said that it’s easier to pass your test if you take it in a rural area, as you learn routes in a more predictable environment – compared with a more urban area where you face multiple hazards and have to make decisions faster. Figures from DVSA (Driver and Vehicle Standards Agency) show that, while the average pass rate is 47.1%, you were almost 15% more likely to fail if you took the test in Belvedere, Bexley – something that some people actually put down to the examiners (they’re too quiet, apparently! ), rather than the roads. Unpredictable roads, grumpy examiners, unsympathetic motorists, a particularly ballsy squirrel – whatever. Truth is, passing your test really comes down to a combination of practice and nerves – both of which are in the control of the student. It’s all too often that I hear people say that they can only afford a handful of lessons and then want to sit a driving test, or they’ll only need 10 to 15 hours because they learn quickly. But, then they here the words no learner wants to hear …you haven’t passed your test today. You just can’t short cut practice and hope you’ll scrape through. And yes, some people are natural drivers and do learn quicker than most, but they listen to their instructors advice before jumping in head first and booking a driving test. Driving tests are a challenging, and an uncomfortable place for learners, but those who pass, especially at their first attempt have had enough practice with a professional instructor, they’ve learned their theory, and they’ve managed to keep their nervous under control. So, if you’re contemplating booking your driving test, speak with your driving instructor first and listen to their advise, their are generally right.